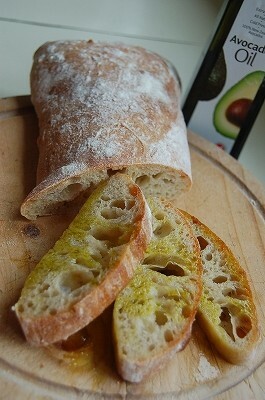 Today, I made Ciabatta with Avocado oil. 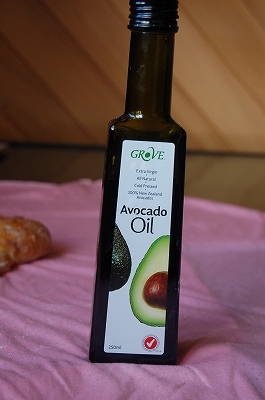 Avocado oil is made in New Zealand. It is quite strong flavor and green color. I use it for salad, dipping and bread! I love slices of bread with avocado oil. 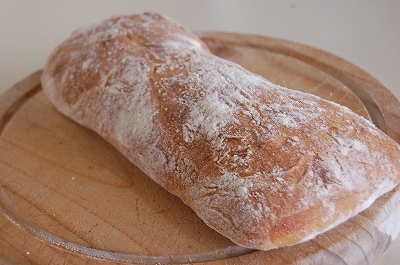 Ciabatta is No-knead bread, that is simple to make. Just stir all ingredients with spatula in a bowl. At first, the dough is very sticky. Proofing 1hour and 2 hours later, fold the dough for couple of times. 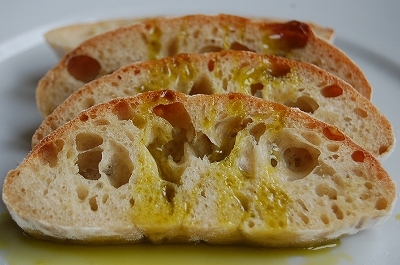 It is difficult to handle the dough, because it contains 70% of water. I set the dough on the baking sheet during the second proofing. I can transfer the dough with the baking sheet as keeping the nice shape and air bubble. It took 2 days to make it. Making polish, proofing final dough... I set it overnight. Time makes gluten development well. Crispy crust and chewy crumble. Ideal for sandwich and panini. 1. 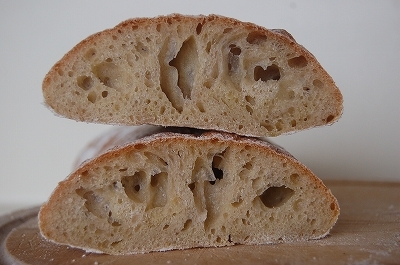 In a container, combine flour, water and sourdough starter and stir. Set it 6-10 hours to ripen at room temperature. 2. In a large bowl, combine flour and salt. Add sourdough starter and water, avocado oil. Mix with a spatula, combine the ingredients till water and flour combined well. 3. 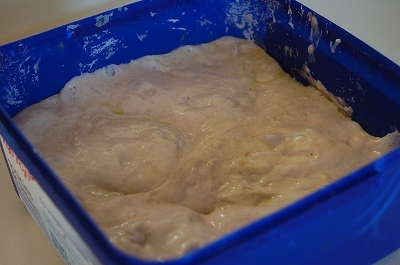 Put the dough into a oil sprayed container with cover, place it room temperature. 1 hour and 2 hours later. 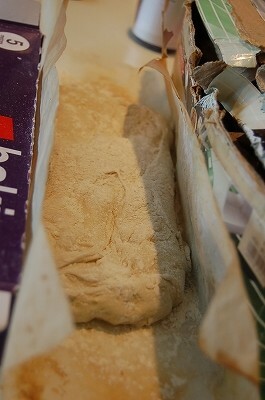 fold the dough on the floured counter. Put it back to the container, then set it till it becomes double size (about 8 - 12hours). I set overnight. 4. Turn the dough out onto a very well floured counter. 5. 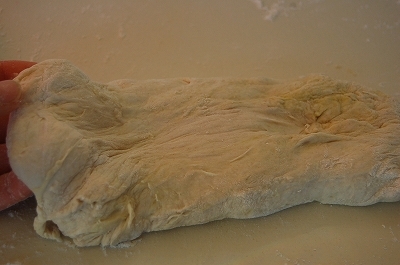 Shaping from the center towards the edges, very gently stretch the dough into a rectangle about 2 cm in height. Try not to degas the dough. Keep the air bubble in. Gently, put the dough onto a well floured baking sheet. Put the boxes on both side to keep the shape. 6. Proof the dough with plastic cover for 1.5 - 2 hours at the room temperature until the dough is very light and full of gas. 7. Meanwhile, preheat the oven and a baking pan at 240℃ with steam. 8. 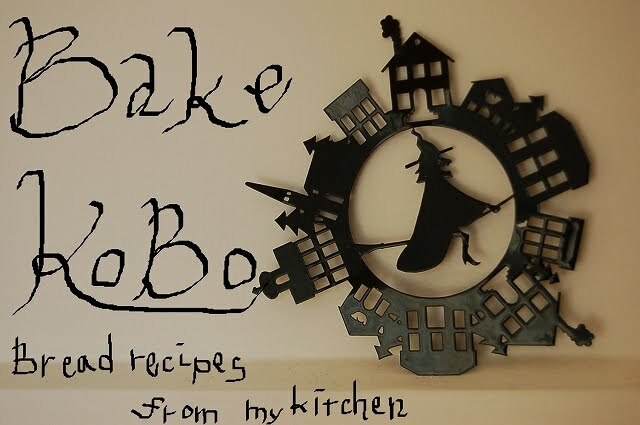 Take the baking pan out, transfer the dough with baking paper on it. Bake it 230℃ with steam for 8 minutes, then 20 minutes without steam or crust becomes well golden brown. Turn off the oven, crack the door, and keep it inside for another 5 minutes. 9. Cool it down on the wired rack.